Polish built, WSK PZL-Mielec An-2, seen in 07 zgłoś się'. The Antonov An-2 was a single-engined bi-plane first built in 1946 in the Soviet Union. It has a variety of uses although primarily agricultural and utility roles both as a civil and military aircraft. Large numbers were produced in Poland by WSK PZl-Mielec, as well as the licence produced Shijiazhuang Y-5 in China. 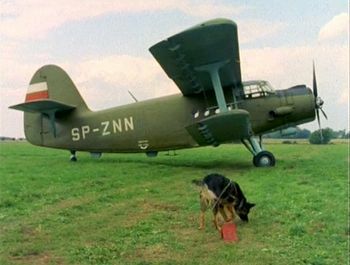 This page lists all films that feature a variation of the Antonov An-2. Pages in category "Antonov An-2"
This page was last modified on 25 June 2017, at 17:48.